Today is net neutrality day of action in the United States, a day of advocacy and awareness that brings together hundreds of leading Internet companies and public interest groups. It is an important reminder that the principle of an open, neutral Internet is under threat there due to dramatic shifts in policy driven by the Trump Administration and changes at the Federal Communications Commission. 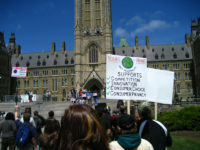 While U.S. rules undoubtedly have an impact on Canada – the viability of new innovative Internet businesses that might enter the Canadian market is linked to rules that ensure that Internet providers do not use their privileged position to favour some applications and services over others – the political and regulatory situation between the two countries is dramatically different. The Liberal government has been a staunch supporter of net neutrality, regularly citing its importance. For example, Budget 2017 referenced the need to “benefit from an open and innovative Internet” and Innovation, Science and Economic Development Minister Navdeep Bains has emphasized the value of an open Internet in discussing telecom policy. When the Province of Quebec’s unveiled plans to mandate blocking of unlicensed gambling websites, Canadian Heritage Minister Melanie Joly responded by focusing on the need for net neutrality and the equal treatment of Internet content. The CBC reports on a new campaign to scrap the CRTC.